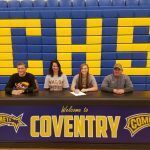 Senior Anna Kimevski signed her letter of intent to play softball at Walsh University next year. Kimevski will be a four year letter winner for the Comet softball team and was also a four year letter winner for the volleyball team. She is also a member of the National Honor Society and Senior Video class. The softball team defeated Canton South last night 13-2 in the opening round of tournament play. Freshman Stacey Arnold led the way with 2 home runs. The girls advance to play at Hoban tonight at 4:30 pm in the Sectional final. The softball team lost to Norton last night 11-5. The girls are now 14-4 on the season and 9-4 in the PTC. They play at home vs. Norton tonight to wrap up the regular season. The softball team defeated league powerhouse Springfield last night 16-6. 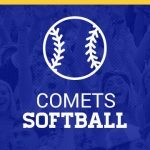 Leading the way for the Comets were sophomore Jasmine Yates with a home run, junior Anna Kimevski with a triple, freshman Meadow Odum who was 3-5 with 2 doubles, sophomore Taylor Norris with a double, and senior Kiena Elekes who was 4-5 at the plate.